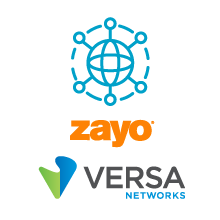 To help customers on their AWS migration journey, Zayo and Versa Networks have packaged Versa Secure SD-WAN, managed by Zayo. This solution enables customers to quickly and confidently execute their AWS migration and maximize the value they can derive from their AWS environment. By leveraging Versa’s SD-WAN technology and Zayo’s experience and knowledge with cloud networking, customers get secure, performant, and reliable connectivity between their on-premises data centers/ branch offices and AWS. This solution is offered by Zayo Group, and AWS Partner Network (APN) Advanced Technology Partner and AWS Networking Competency holder and Versa Networks, an APN Technology Partner. AWS Networking Competency Partners deliver cloud migration implementations, integrate relevant AWS services, and accelerate the ramp-up of new users. This solution was developed in collaboration with Versa Networks and Zayo Group, LLC. Customers can purchase this end-to-end solution by engaging directly with Zayo. APN Partners with the Networking Competency designation offer consulting services to help you quickly discover value from networking solutions from partners on AWS. Follow these links to find more about these APN Partners and their consulting offers, and to request more information or support. You are responsible for the cost of the AWS services used while running this solution.